Chamaesyce polygonifolia is a native annual with reddish(whitish)-colored stems that have a flat spreading habit. As one of its common name suggests, the reddish (whitish)-colored stems of this native annual have a flat spreading habit. By: Beck, Lewis C., Albany Printed by Webster and Skinners ..., 1833. USDA-NRCS PLANTS Database / Britton, N.L., and A. Brown. 1913. An illustrated flora of the northern United States, Canada and the British Possessions. 3 vols. Charles Scribner's Sons, New York. Vol. 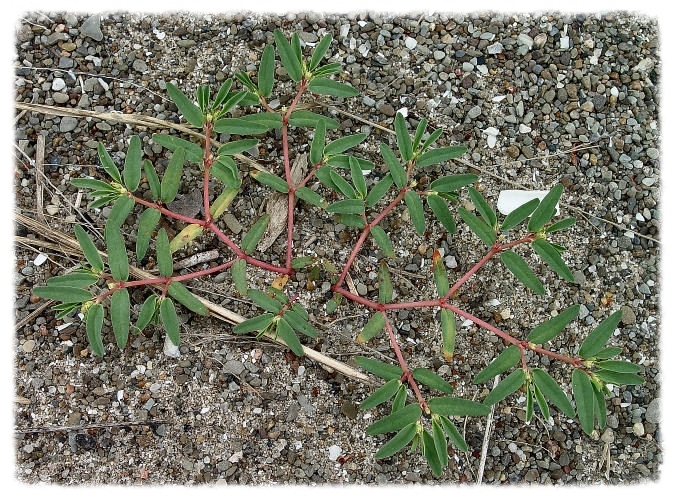 2: 463.
and there on the pure sandy shelf, between the ordinary high-water mark and the foot of the bank, were Sea Rocket (Cakile Americana), Saltwort (Salsola kali), Sea Sandwort (Honkenya peploides), Sea Burdock (Xanthium echinatum), Sea-side Spurge (Euphorbia polygonifolia); also, Beach Grass (Arundo, Psamma, or Calamagrostis arenaria), Sea-side Golden-rod (Solidago sempervirens), and the Beach Pea (Lathyrus maritimus) ..."